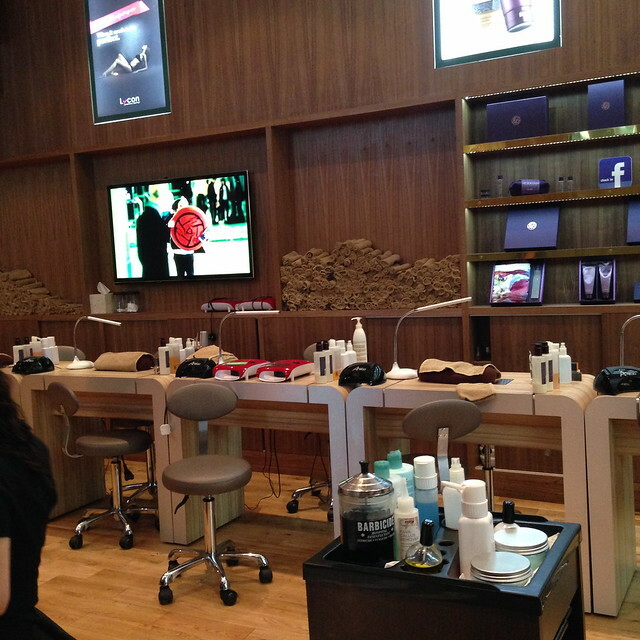 I absolutely adore visiting salons and spas, it has to be something I adore in the beauty world ahead of pretty much anything else. It’s something that sparked my love of beauty surprisingly early in my life when I used to go along with my Mum on Saturday mornings to a beauty salon in my home town, usually spending time oohing and ahing over all the pretty lotions and potions whilst my Mum had something done and then as I got into my later teen years occasionally I’d get to try something too – a deep cleansing facial when I had bad skin, or my first ever fake tan experience (I was 16 and it was a St Tropez full body application) one of the things I love as a partly pampering, partly practical treatment is a pedicure. Sure, it’s something I can do myself at home – but never to the same quality as in a salon. Queensway/Bayswater are slightly odd areas of London in my opinion, in some ways it’s really central and a stones throw from Hyde Park which makes it a really ‘premium’ neighbourhood, but on the other hand the road itself is filled with the sort of tacky tourist shops and kebab shops and the like… making it feel not so premium…so with that contrast, I didn’t totally know what to expect when I arrived! 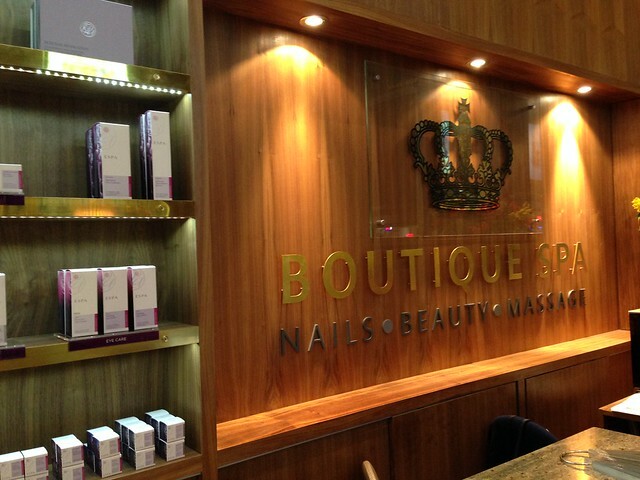 But my first impressions were really good – the salon looks really lovely and smart from the outside and when you walk in the main area is large and spacious, with a roomy reception area with a wall of nail colours to choose from. There’s a bank of pedicure chairs/basins along the wall, with chairs that are raised and spacious, so you can really get comfy whilst you’re pampered. The TV was showing classic R&B videos, which kept me entertained! The therapist was friendly, but didn’t feel the need to make small talk – which I was perfectly happy with as I quite like to just sit and chill out whilst the treatment is happening. I was offered a drink and invited to choose a colour – I went for Essie Wicked a shade I’ve had my eye on for ages and when applied I loved it even more. A deep dark red shade that’s perfect for Autumn. I loved the shade so much that I picked up my own bottle a couple of days later. 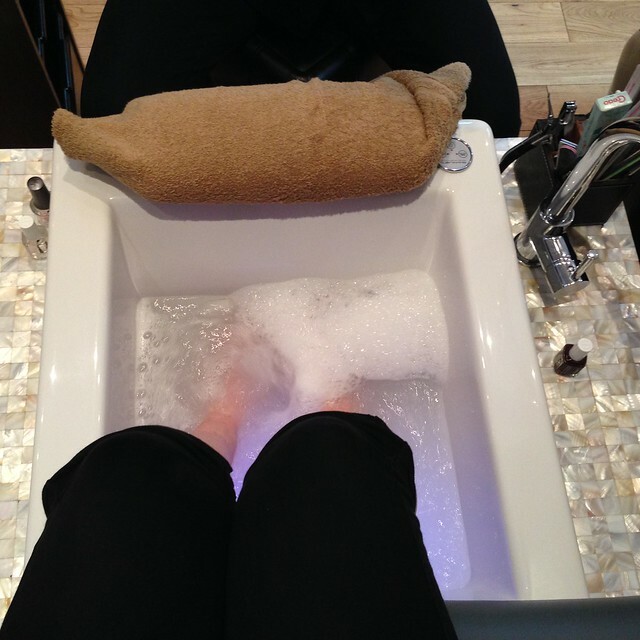 But back to the pedicure – it was really good, took just over an hour to complete – was really thorough, I was scrubbed, massaged, buffed and nails files and polished to perfection. Overall, my nails were left looking dark, glossy and perfectly finished off. The best thing about having a pedicure in Autumn? It lasts so much longer than in Summer! The colour itself actually lasted around two weeks before I spotted a chip – very impressive! Spending such a large amount of time on my feet, I’ve been in dire need of a pedicure of late, these look gorgeous so it was a nice reminder to sort my footsies out! Looks like such a lovely experience! I love getting pedicures but I have such sensitive feet I literally have to bite my tongue to stop myself from laughing!